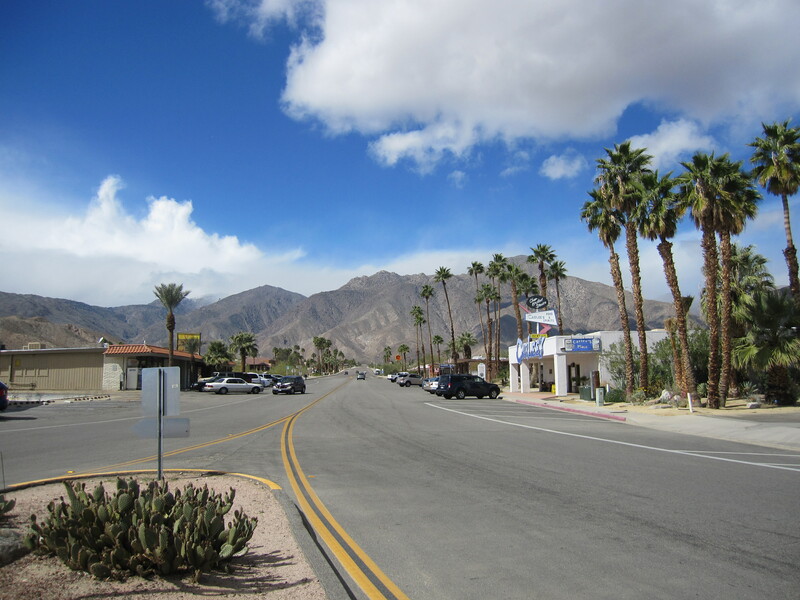 So, we spent Sunday 3/10 in Indio, running errands. Wanted to go to Walmart, Trader Joe’s (Everyone raves about TJ’s. Good, but small than expected.) and do laundry. Also, hoped to be able to watch the NASCAR race in the afternoon. Got parked at the laundromat, fired up the TV, aimed the antenna and I was able to watch the race and do laundry. Thanks Dad for installing the great solar setup and new Jack antenna!! 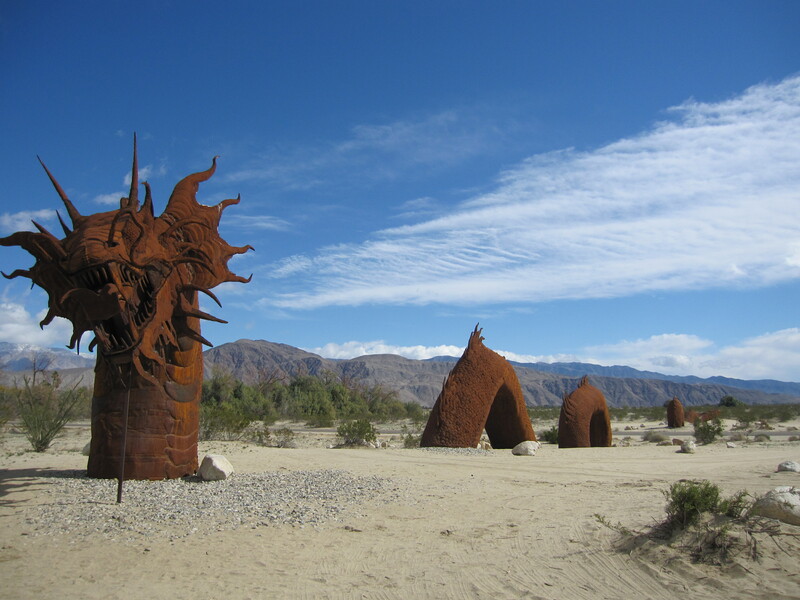 I had originally planned to spend the night in Indio, but we got done so early that I went ahead and headed on. 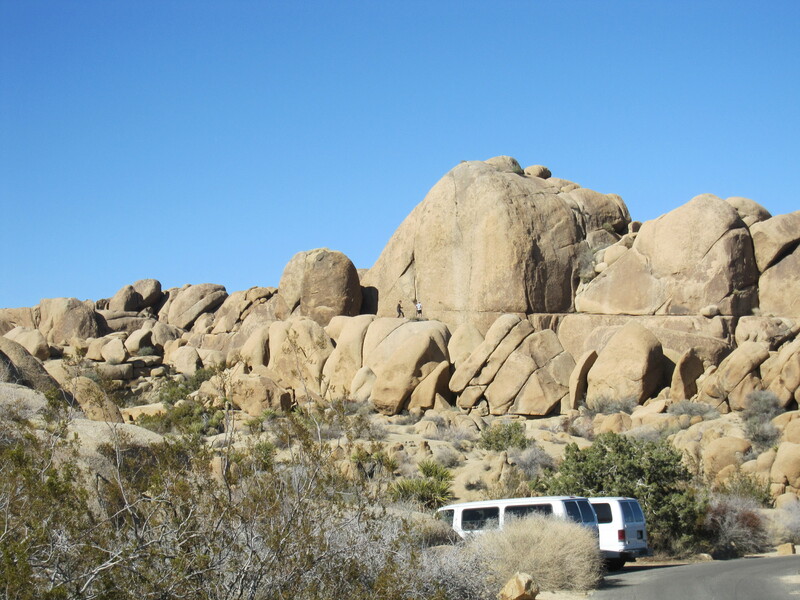 Joshua Tree has overflow parking on BLM land right outside of the park, just off I-10. So I pulled in there, near 3 other rigs. 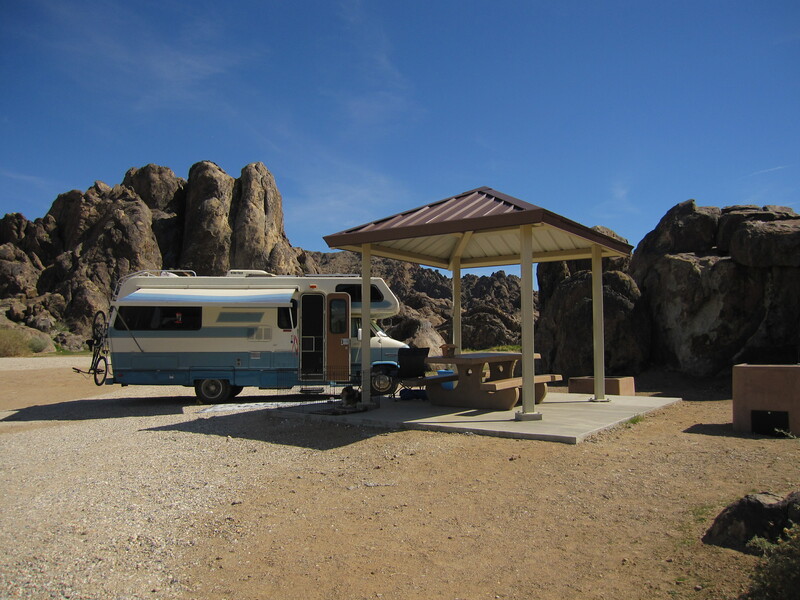 I like to find a good boondock spot right outside the national park so we can go in early and beat the crowds or find an available site in the popular campgrounds (like we did at Zion and Grand Canyon last year), so this site was really handy. Anyway, Monday morning we drove in to the park. 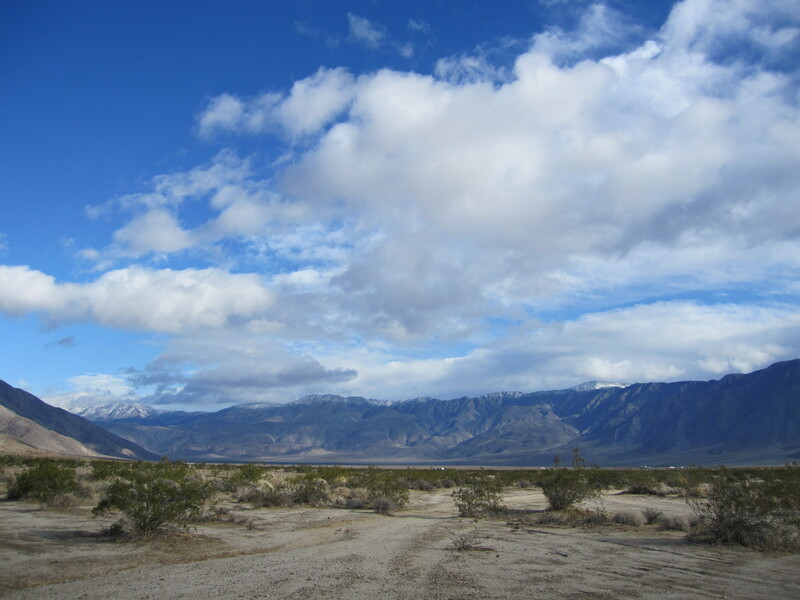 Turns out there was a big earthquake that morning close to the town of Anza, near where we were camped the prior week. Never felt anything as we were driving at that moment. Anyway, I visited the Cottonwood Visitor Center and hiked the trail past the Cottonwood Spring. 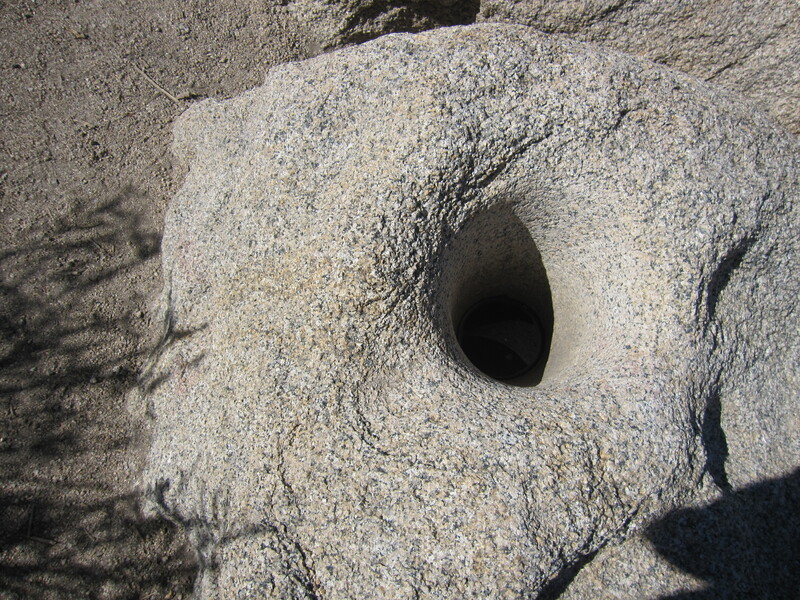 They had a sign showing the mortal holes created long ago, over many years, when Cahuilla Indian women would grind seeds into flour. 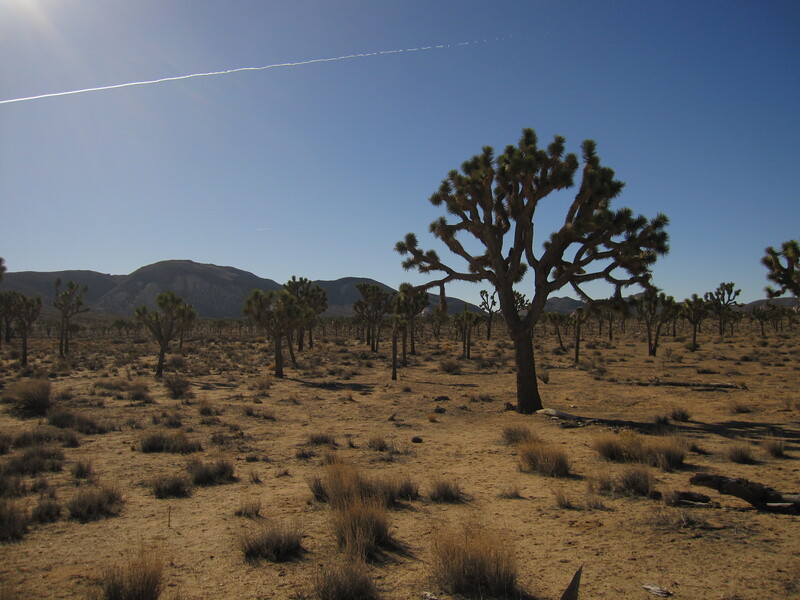 Joshua Tree NP is not all Joshua Trees. There are 2 deserts that meet in the middle – the Colorado and the Mohave. The Colorado is lower and has a lot of creosote, palo verde, ocotillo, etc. 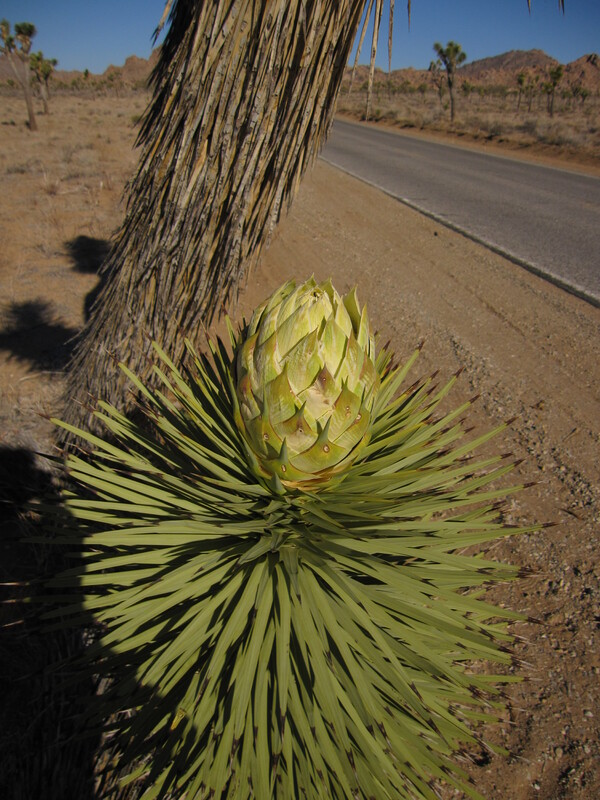 The Mohave begins at higher elevation, and you start seeing yucca and Joshua trees. 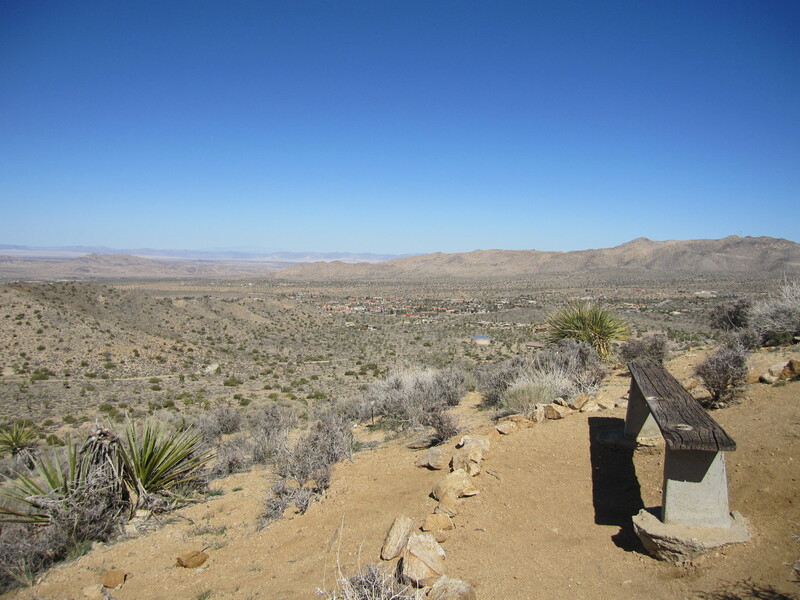 There is a lot to see when driving the Pinto Basin Road across the park towards the northwest. Lots of places to stop and read displays and notice the different desert features. 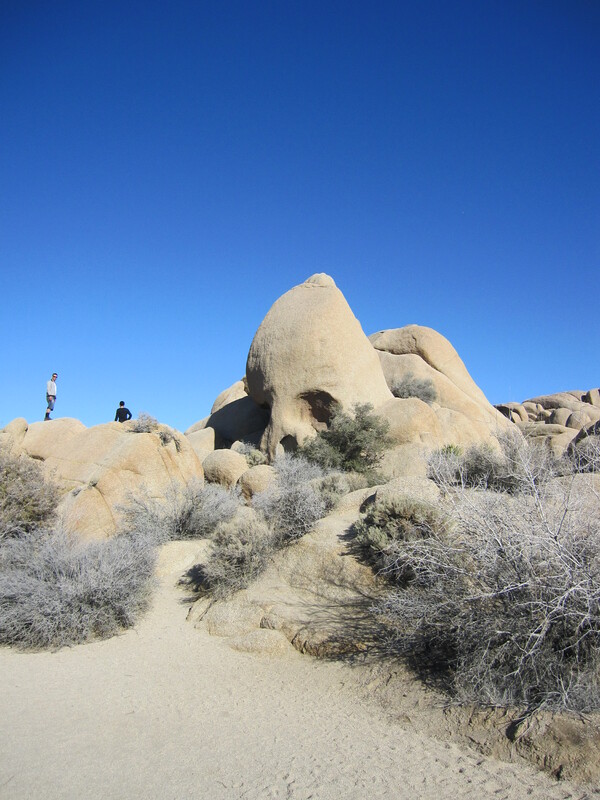 We stayed at the Jumbo Rocks campground and I hiked the trail there – part nature trail, part hike to the Skull Rock. 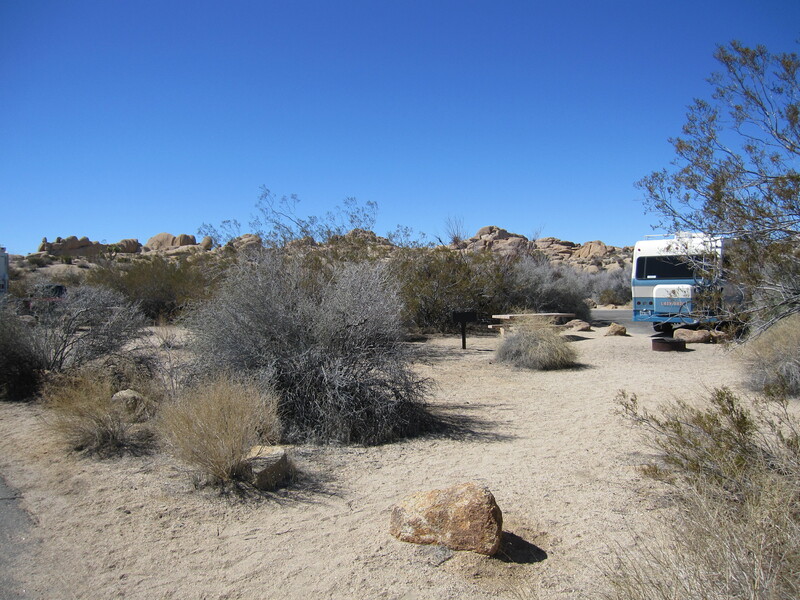 The next day we drove through the park to Black Rock Canyon campground. I hiked the High View Trail, which is quite a climb. Riley stayed home, dogs not allowed on trails. New blooms look like a pineapple or something. They’re huge. 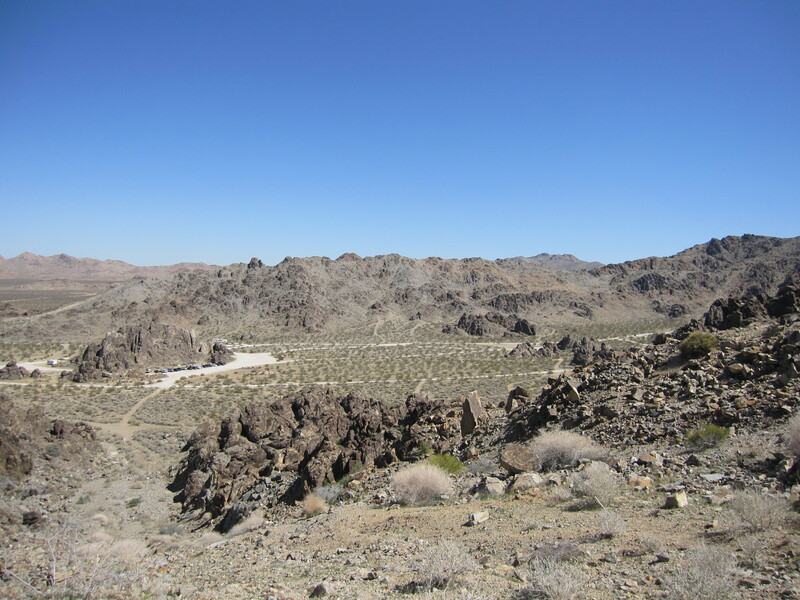 On Wednesday, the 13th, we moved on to Sawtooth Canyon. It’s a (free!) 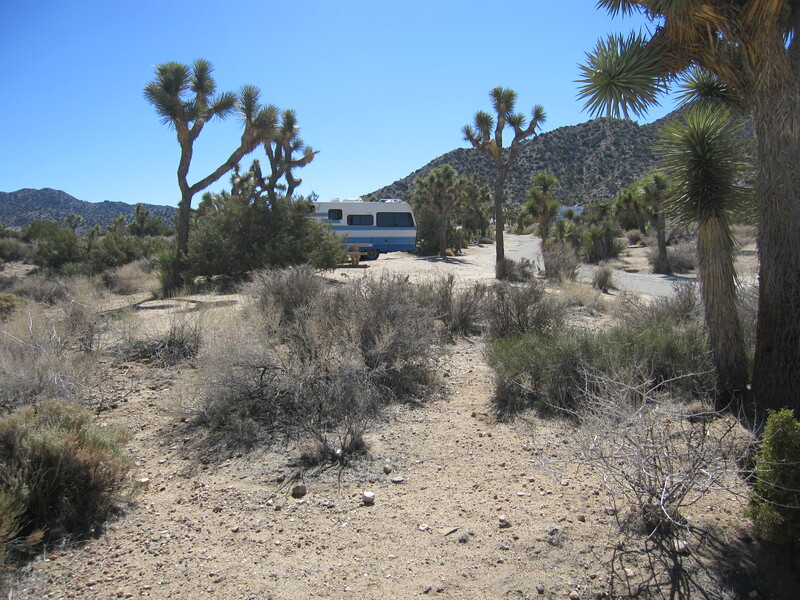 BLM campground between Lucerne Valley and Barstow on hwy. 247. 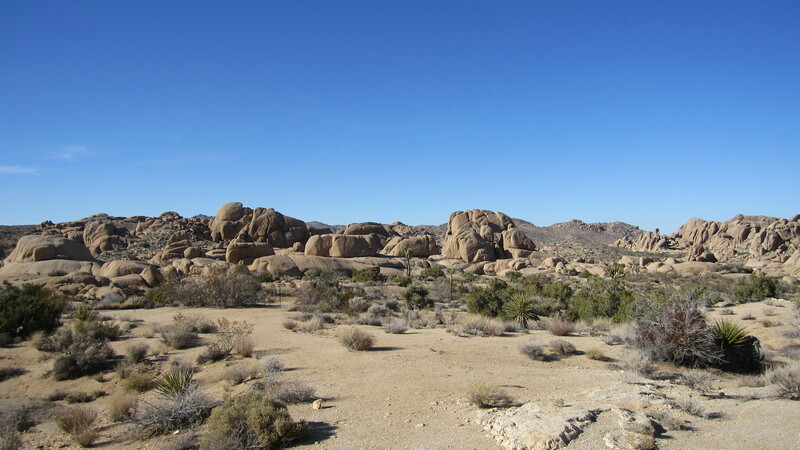 It had gotten pretty hot in southern CA, but Sawtooth is just off of a pass between the Granite and Ord mountain ranges, at about 3550 elevation. So, we would be able to stay cool there for a week or so, until it was time to get water and dump tanks. The sites are nice, with a covered concrete table area and 2 fire pits/grills. I set up Riley’s pen and even put out my awning. The campground is really spread out and we walked all over and up to the top of the hill/canyon, where there is a trail for back-country camping. There were 3 guys with packs going off that way when we were up there. (More power to them. I love my Lazy Daze conveniences.) On Saturday we hiked a big hill that was maybe some kind of road at one time. 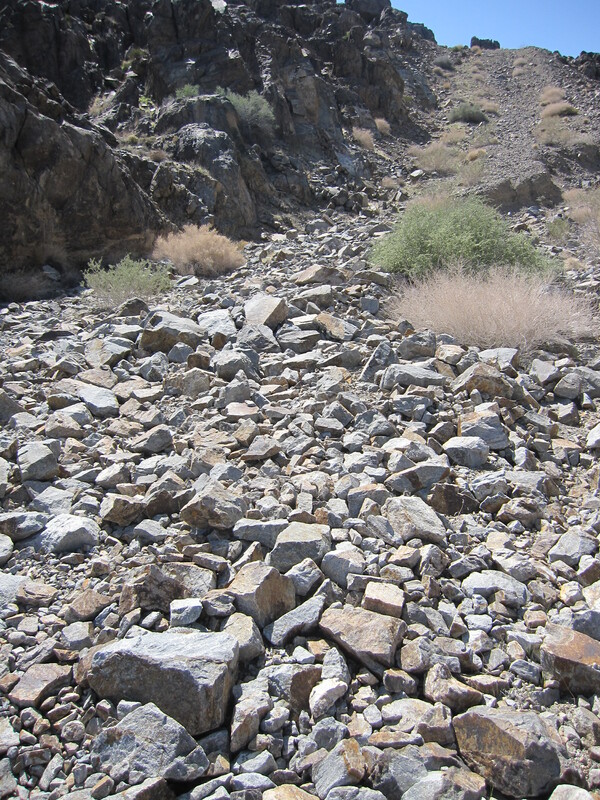 Very steep and rocky. There were a bunch of cars at the 3 sites near us that turned out to be the San Dimas Mountain Rescue Team, having a training campout or something. So, that was comforting, looking down from the top of the hill. Over the weekend I had been talking to Chris, who I met at the Lazy Daze gathering in Quartzsite in January. We had parted at Fortuna Pond on Feb. 13th to continue our travels in separate directions. He was at Alamo Lake in Arizona, enjoying his kayak and doing some fishing. 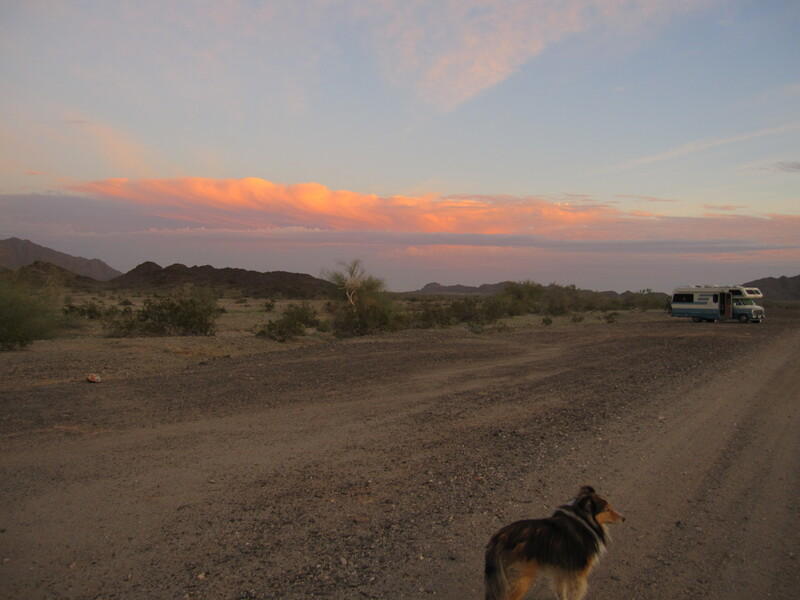 We missed each other and decided to meet up halfway, which was off I-40 around Goffs, CA, near the Mohave National Preserve. Also, my folks were about to take a road trip to Las Vegas, and I thought maybe I would try to meet up with them on their way back to TX. 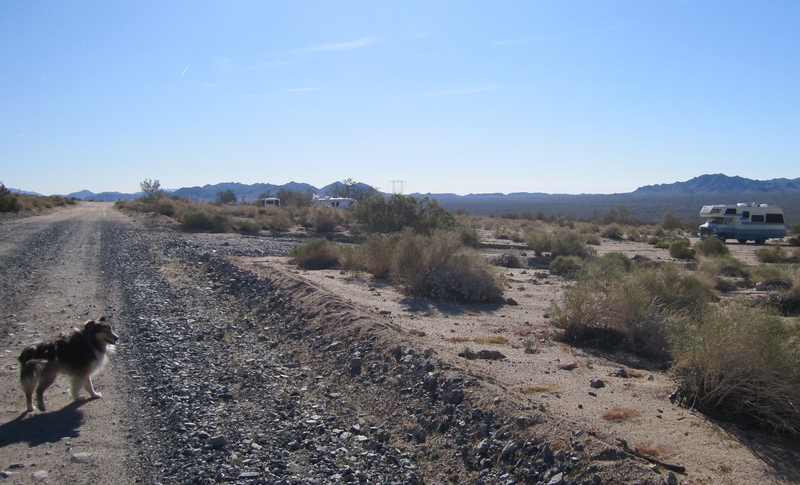 More about visiting in Mohave and NV/AZ in the next post. And once again I am behind in updating the blog. Currently I’m at Lake Isabella in California, but was in Arizona last week and Nevada the week before. Been going and doing. So, here’s the post-Yuma happenings. 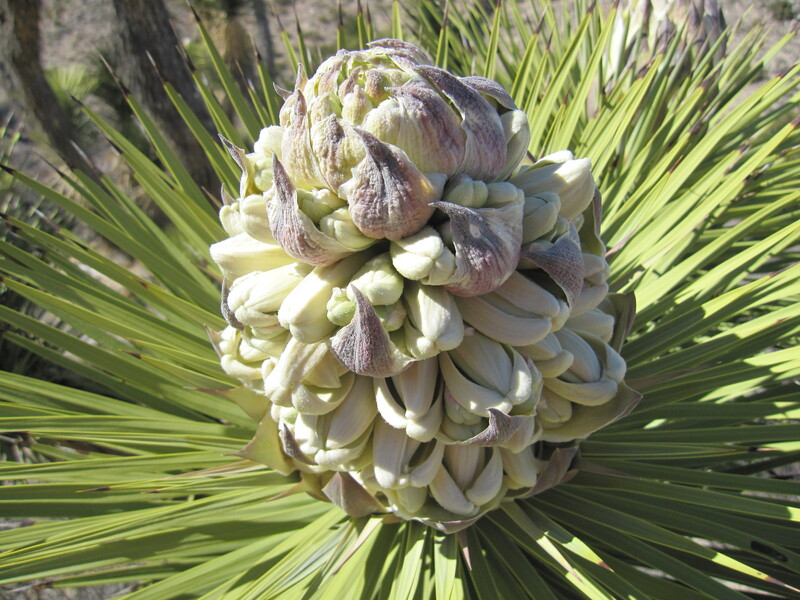 The desert plants were budding out and just starting to bloom. We passed a lily type plant each day and it looked like it would be blooming soon. It did bloom right before we left. So pretty. We had a good site and visited with Bob, Katie, Tara, and Tricia. On 2/25 we headed on, popping across the border to Algodones, Mexico to see about getting some new glasses and maybe a dental checkup (I’m on a high-deductible health plan). Didn’t find a good deal on glasses but picked up some Amoxycillin to have on hand. 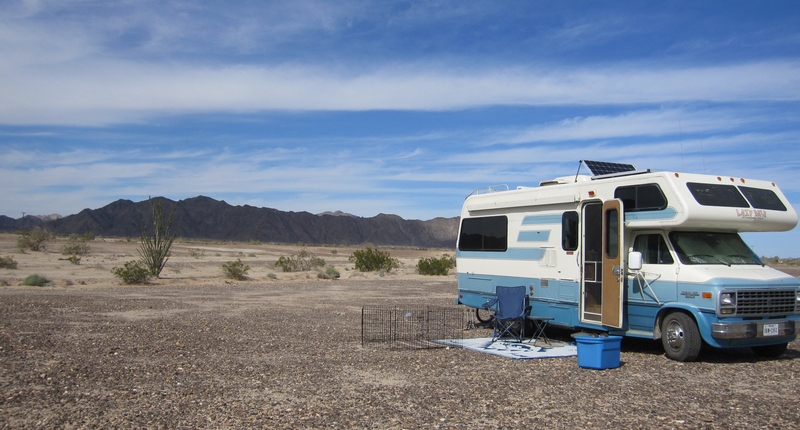 We moved on up I-8 a little to Ogilby Road and then to American Girl Mine Road, where RVSue and Wheeling It had written about good boondocking locations. There is a lot of space further back off the main road, and rigs are pretty well spaced out. Riley and I hiked the old mining roads and hung out. I finally got back into some bookbinding. I hadn’t done any since before I got busy selling the house and stuff. I picked up some leather pieces on my recent travels to make leather journals. 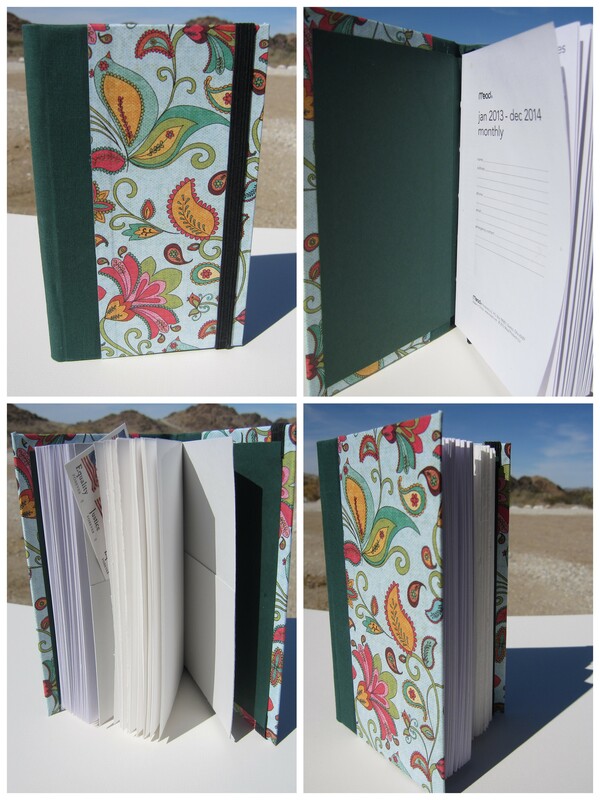 I also like making these hardcover journals with calendar inserts and pockets. I’d like to eventually get some stock built up and set up an Etsy store online. 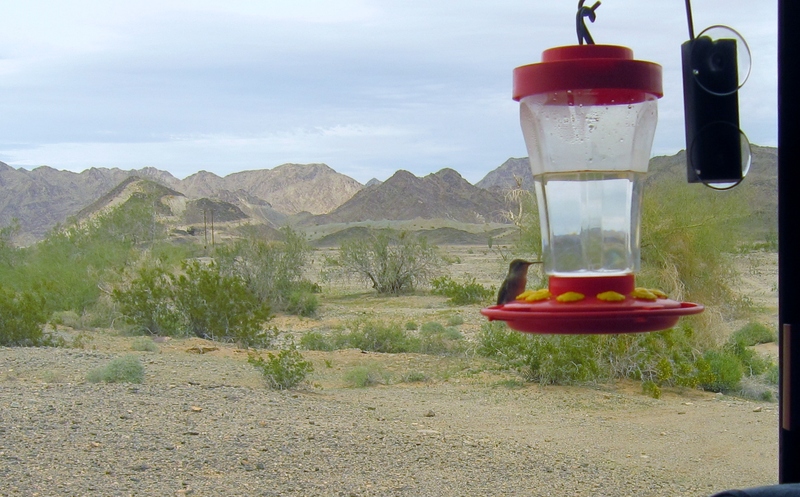 Also, I got out my hummingbird feeder at Ogilby. Fun watching the little guys feeding. Especially when the wind is blowing and they hold on tight as the feeder rocks back and forth. I really like this feeder with the foot perch and suction cup hook thingy. Of course I have many sunset pictures. Can’t help it. 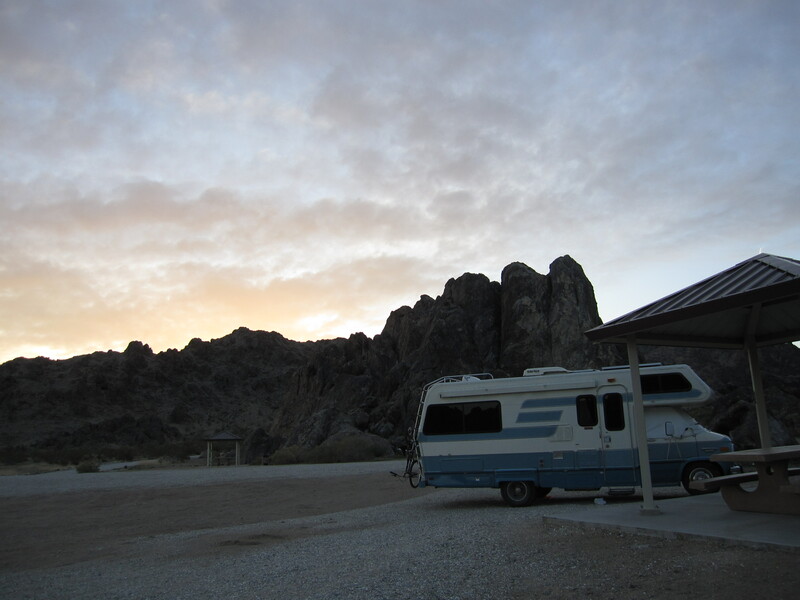 On March 4th we headed over to Anza-Borrego State Park. Again, I had read RVSue and WheelingIt writings about the area, and it looked like a good stop as I moved north. 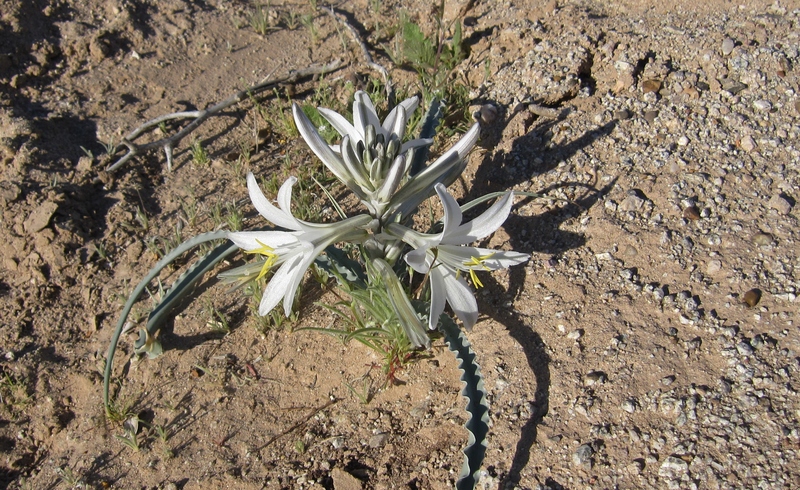 Plus, the wildflowers were supposed to be peaking around Mid-March. 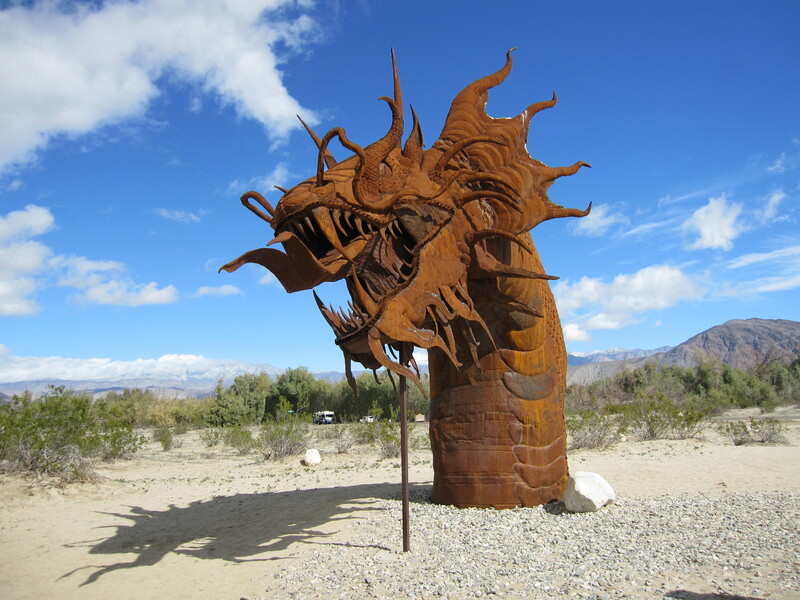 My folks had sent off my mail and it was waiting for me at the Borrego Springs post office. I drove through the town and up to the State Park visitor center. The lady at the V.C. said the wildflowers would be poor this year due to weather conditions. Maybe later, if they got some rain. Bummer. 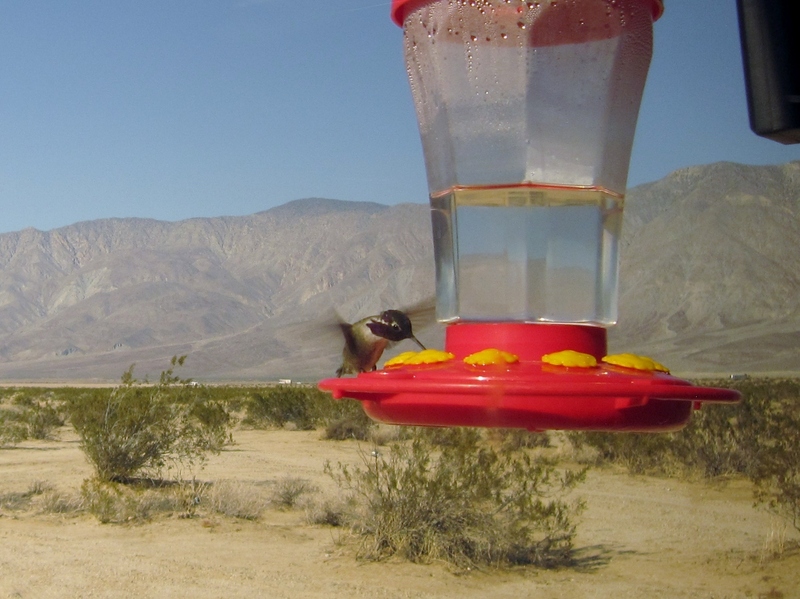 We did get to have a good hang though – desert hiking, checking out the large sculptures at Galleta Meadows (Ann and Jerry have a good write-up on those), farmer’s market in town, watching hummingbirds, etc. 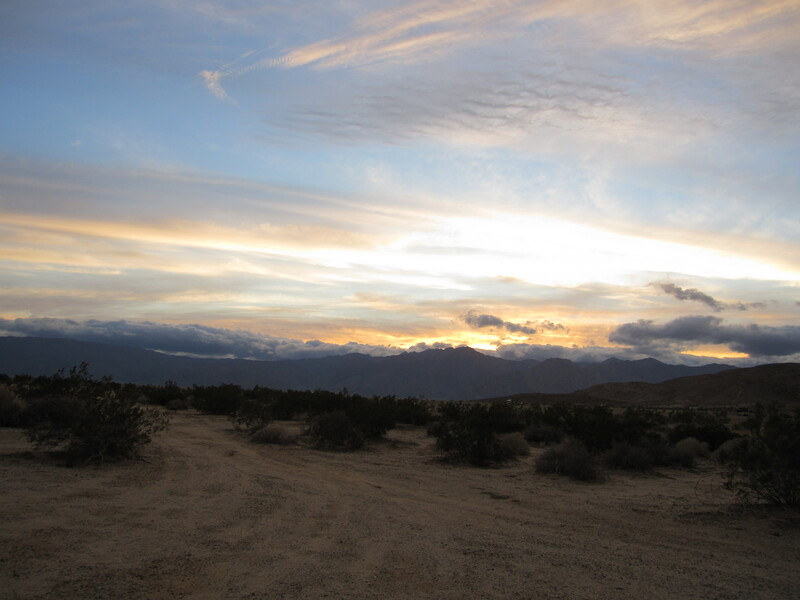 View from my Anza-Borrego site. A little bit of snow on those mountain peaks. Serpent Sculpture. If you look close you can see the first 3 sections are on one side of the road, with the next section and tail on the other side. So amazing. 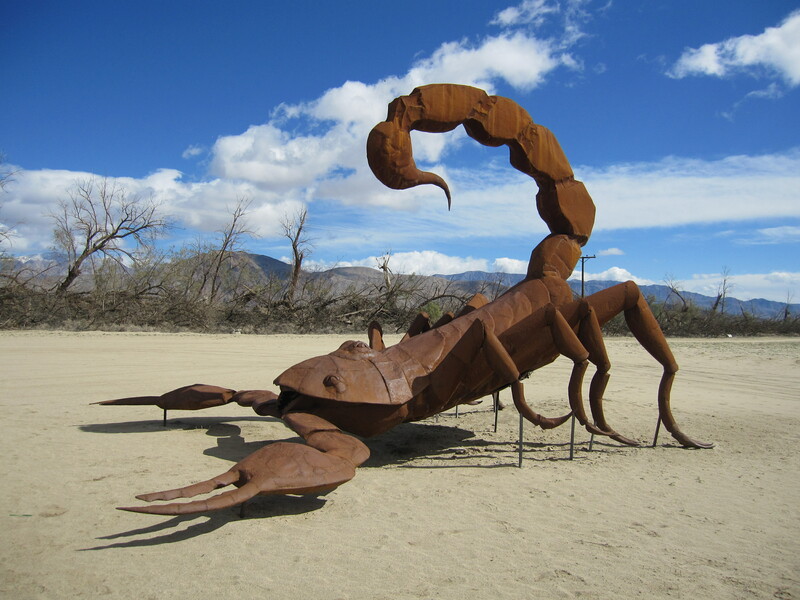 For my sister-in-law Bev, who has a metal scorpion (about 4 ft.) in her front yard. This would go nice next to it, huh? Too many pictures already. 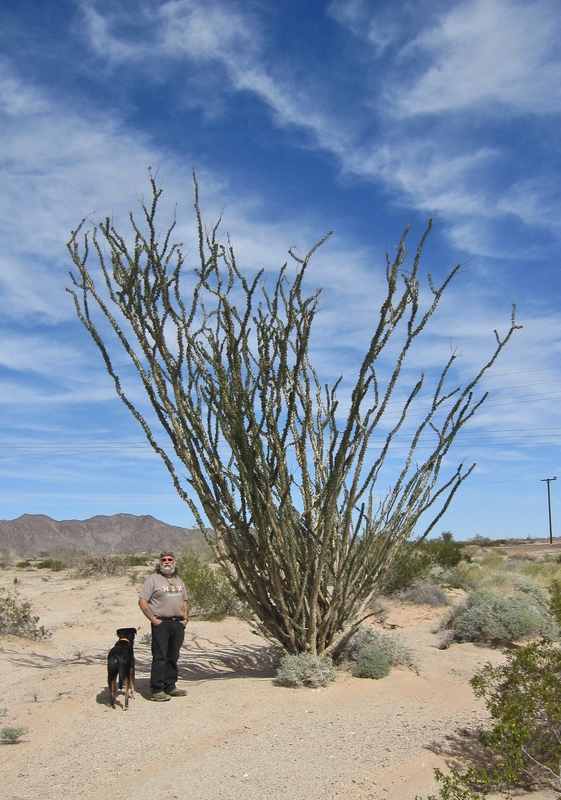 Will pick up on Joshua Tree next.